Marking the Club’s 70thanniversary in 2018, fundraising was kick started with the ‘buy-a-brick’ appeal to support the members’ £70,000 fundraising target. 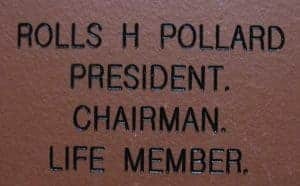 The first batch of engraved bricks is now in place. This has already raised several thousand pounds but there is plenty of room for more engraved bricks. Will you “buy a brick? Can you persuade your boss to buy a large brick with the company name? Full details of how this works can de downloaded here. Alternatively contact Steve Brown who is leading this part of the fundraising campaign. Click here to contact him by email.